Accounting principles are a uniform set of rules or guidelines developed to ensure uniformity and easy understanding of the accounting information. As per this principle, business is treated as a separate entity that is distinct from its owners and all other accounting bodies. Hence a separation should be made between personal transactions and business transaction. For example, in case of sole proprietorship, though the legal entity of the business and its proprietor is the same, for the purpose of accounting, they are to be treated as separate from each other. As per this principle, only those transactions which are capable of being expressed in terms of money are included in the accounting records. The information which cannot be expressed or measured in terms of money is not included in accounting records. According to this concept, accounts should be prepared after every period and not at the end of the life of the entity. Usually this period is one accounting year. According to this assumption, the enterprise is normally viewed as a going concern that is, continuing in operation for the foreseeable future. It is assumed that enterprise has neither the intention nor the necessity of liquidity. The unused resources are shown as underutilized costs as against the break-up values as in case of liquidating enterprise. As per this principle revenue is recorded, when sales are made or services are rendered and it is immaterial whether cash is received or not similarly expenses are recorded, whether the cash is paid or not. As per this principle, accounting principles and methods should remain consistent from one year to another. These principles and methods should not be changed from year to year in order to enable the management to compare the profit and loss account and balance sheet. According to this principle, anticipate no profit but provide for all probable losses should be applied. 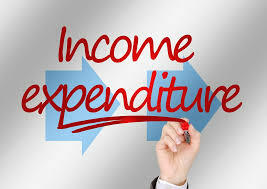 An accounting principle that requires recording expenses and liabilities as soon as possible, but the revenues only when they are realized. As per this principle, the financial statements should act as a means of conveying and not concealing. The financial statements must disclose all the relevant and reliable information which they purport to represent, so that the information, may be useful for the users. This principle is an exception to the full disclosure principle. The full disclosure principle requires that all facts necessary to ensure that the financial statements are not misleading must be disclosed, whereas the materiality principle requires that the items having an insignificant economic effect or not being relevant to the users not need to disclose. As per this principle, an asset is recorded in the books of accounts at the price paid to acquire it at the time of its acquisition and the cost becomes the basis for the accounts during the period of acquisition. As per this principle, the expenses incurred in an accounting period should be matched with revenues recognized in that period. As per this principle, each transaction is composed of two part-one for debit and other is for credit every debit has an equal amount of credit.